Brad Smith of Brad Smith Construction and Neal Hatfield of Uplands Reach Teen Camp formed a mission team to paint the interior of our SPARK Unit. 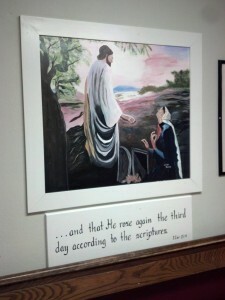 They also created a series of art panels, depicting Biblical scenes, to line the SPARK hallway. We thank them for this wonderful art and the compassion they have shown our residents. The garden and courtyard were redone by North Wilkesboro Presbyterian Church. From weeding to power washing, painting and installing artful bird houses these wonderful volunteers had the courtyard looking prettier than ever. 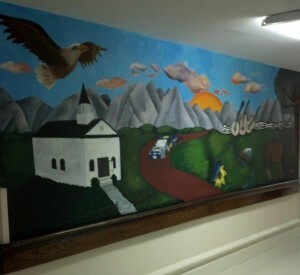 Seniors, Laura Delbridge and Breyetta Elam, created this lovely 4 foot by 7 foot mural in a hall within our facility. It depicts cultural and historical symbols of Wilkes County. We want to thank them for the many hours and hard work. And a shout out to their art teacher, Michelle Robert.